Preheat a large cast iron griddle or grill pan on medium flame. Butter one side of each slice of bread with a thin layer of the butter. Assemble the spinach and artichoke panini by starting with a few slices of the smoked mozzarella, topped with a few artichoke harts quarters sprinkled with a pinch I sea salt, half of baby spinach and topped with more smoked mozzarella and a slice of bread. Place the panini buttered side down on the hot cast iron griddle. Loosely cover with aluminum foil and turn the flame down to low. 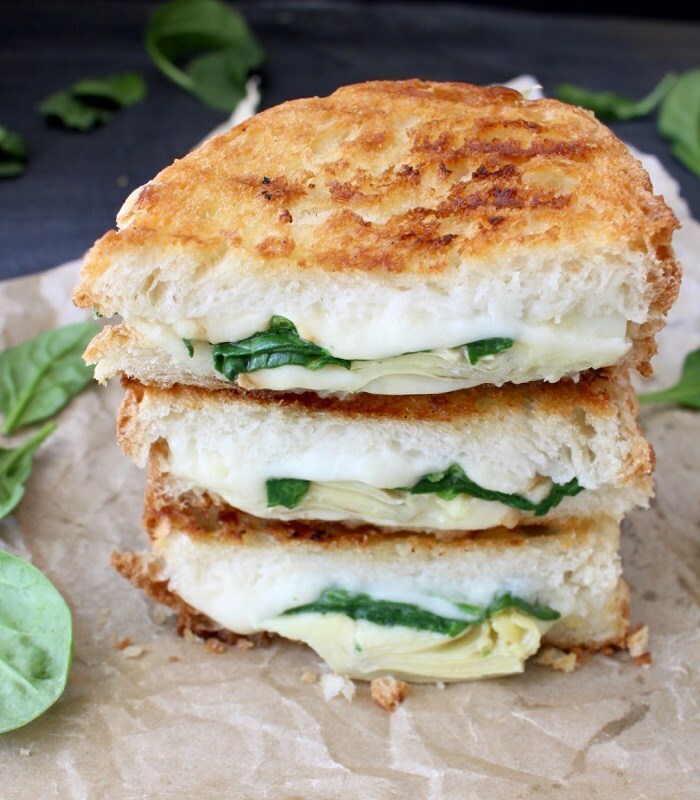 Cook the panini for a few minutes on each side until golden brown and cheese has melted. Make sure to gently flip it using a wide spatula. Once you remove it from the pan, use the garlic clove to gently rub the top of the panini. Allow the cheese to set a little bit before cutting or biting into the panini.